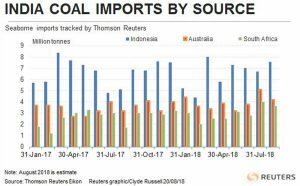 LAUNCESTON, Australia, Aug 20 (Reuters) – India's coal imports appear headed for another strong month in August, raising the question as to why the usually cost-sensitive market hasn't scaled back purchases given a surge in prices to the highest in nearly seven years. Total coal imports may reach 17.7 million tonnes in August, according to vessel-tracking and port data compiled by Thomson Reuters. This figure may be revised as it becomes clearer when ships will arrive and discharge their cargoes, but the August imports are likely to be more or less in line with the 17.4 million tonnes imported in July, which was the strongest monthly outcome so far in 2018. India's coal imports have been exceptionally strong and are on track to rise for the first year in three in 2018. This is despite prices for thermal coal rising to the highest in 6-1/2 years, with the Australian benchmark Newcastle cargoes trading above $120 a tonne recently, taking the year-to-date gain to around 18 percent. The gain in prices has been largely driven by strong Chinese imports, partly because of output restrictions at domestic mines and partly because of high demand caused by a recent heatwave. Previously Indian coal imports, especially for thermal grades used to generate electricity, have been thought to be sensitive to price, and likely to decline if prices moved rapidly higher, as they have done this year. But Indian imports have been on an upward trend in recent months, despite the rising prices. An easy answer as to why is to point to the recent difficulties state miner Coal India has experienced in transporting the polluting fuel from pits to power plants. But as Tim Buckley, director of energy finance studies at the Institute for Energy Economics and Financial Analysis (IEEFA), pointed out in a recent note, there is more to the situation. Data from India's Central Electricity Authority show that coal imports for what are termed on-grid power plants, i.e. those that supply power to the network, are actually declining, falling 14 percent in the June quarter. So, as far as thermal coal imports for the power sector are concerned, the price signal is working insofar as they are declining as prices rise. However, as Buckley notes, a large part of India's coal imports are used by consumers other than on-grid power plants. There is a about 30 gigawatts (GW) of coal-fired generation capacity that is used by captive power plants, Buckley said in a recent paper sent to Reuters. These users include aluminium smelters, cement makers and other industrial users, and they are more reliant on coal imports as their demand isn't prioritised by Coal India, effectively meaning they are last in line for domestic supplies. If this 30 GW was run at 61 percent capacity, it would need about 96 million tonnes of thermal coal a year, Buckley said, a figure that represents about two-thirds of current thermal coal imports. Given these consumers have to run their captive power plants in order to produce their goods, they have no option but to turn to imports when Coal India can't meet their needs. It appears that as much as two-thirds of India's current coal import demand is from buyers that aren't price sensitive. This likely means that coal imports will remain robust, at least for as long as Coal India is struggling to meet the needs of the various consumers of the fuel. This dynamic of captive power-plant users importing coal also appears to be shifting the buying patterns of India. In the first seven months of the year, India's coal imports totalled 112.5 million tonnes, with Indonesia the largest supplier at 43.4 million. However, Indonesia's share of imports is declining, running at 38.6 percent of the total so far in 2018, down from 43.8 percent for the whole of 2017. In contrast, South Africa's share of Indian imports in the first seven months of 2018 rose to 18.1 percent, from 17.1 percent for 2017, while that of the United States rose to 9.6 percent from 7.1 percent. South Africa and the United States supply higher grades of coal with greater energy content than Indonesia. It makes sense for captive-power plant buyers in India to seek higher quality coal as it maximises the output from their plants. Australia's share of India's imports is also up, rising to 23.9 percent in the first seven months of 2018 from 22.6 percent in 2017. However, virtually all of Australia's exports are coking coal, used in steel-making, and the increase is likely a reflection of rising domestic steel production, as well as the paucity of Indian supplies of this higher-grade type of coal.